Stride Treglown was appointed as Lead Consultant, responsible for developing simultaneous strategic masterplans supporting the regeneration of Paignton Town Centre and a residential led, mixed-use expansion of the village of Collaton St Mary. The emergence of the Neighbourhood Planning Forum places pressures on the planning system and Local Planning Authorities to navigate a successful path between meeting strategic housing, employment and community planning objectives as set out in Local Planning documents and managing local development aspirations of existing communities. Torbay Council embarked on an innovative masterplanning commission which presented Stride Treglown with an exciting challenge: to develop two concurrent strategic masterplans within the same Neighbourhood Plan area attempting to address urban regeneration opportunities on the one hand and greenfield housing strategic growth requirements in a sensitive landscape setting on the other. Community acceptance or outright opposition determining the direction of travel of the masterplan and the ability, or otherwise, to meet strategic council aspirations/expectations. Increasing housing commitments elsewhere could reduce housing targets locally. It is plausible that, over time, development in the village will not [statistically] be required. This would be detrimental to the future vitality of Collaton and would significantly hinder the realization of tangible community benefits which would otherwise be funded by development. Changes in the approach taken by the Council to protect the landscape qualities of the area leading to increased pressure to develop the mid-range slopes against local wishes: this potentially changing the general character of the settlement. The redevelopment of a previously developed Holiday Park site and the impact generated by accentuating the linear development pattern, making connectivity potentially harder to a village core. The Environment Agency bringing forward, putting back or abandoning water management improvements in the Yalberton Valley, resulting in increased on-site attenuation which could further reducing developable, low lying areas. The Collaton St Mary masterplan was therefore required to balance a number of key issues: namely, how to encourage an appropriate scale of mixed use development that aligns with the broader policy context of encouraging employment led growth in a manner consistent with protecting the inherent landscape qualities of the wider area and without losing the essential qualities of village life. Across the two masterplan commissions, a multi-faceted array of planning issues were investigated: a robust planning, environmental and economic evidence base presented for scrutiny; carefully crafted and facilitated workshops held to build community and stakeholder consensus, and; masterplans developed which enables a phased programme of linked developments to come forward under a managed growth strategy for the area and which retains the essential and unique character of each masterplan area. Community and stakeholder engagement was central to the commission. Multiple techniques were employed to corroborate (and/or challenge) our comprehensive initial area analysis findings, and help inform strategic initiatives which would lead to viable, attractive and deliverable change within the study areas. Our Initial Site Analysis Reporting process included a thorough review of past consultation events and initiatives in order that the team was able to understand the barriers to development, those physical interventions which had generated the greatest “buy-in” from the local community and physical, political and legal constraints which would influence masterplan options and solutions. Detailed communication and engagement matrices were prepared which were discussed with the Paignton Neighbourhood Forum. This assisted in the preparation and distribution of advanced leaflets prior to formal engagement events. Building upon previous consultation events organised by the Neighbourhood Forum, the team organised facilitated and interactive stakeholder sessions and drop-in sessions where qualitative debate led to a better understanding of local needs. Intensive weekend working enabled an expedient feedback loop to be achieved, allowing community and business interests to see the general direction of masterplan travel reflecting their views. In relation to greenfield development, the team undertook a landscape and visual sensitivity appraisal to inform development capacity study. This resulted in a masterplan delivery strategy which focussed on the redevelopment of previously developed land followed by the phased release of land for development to meet community needs and improve infrastructure capacity for the future. Phasing was handled sensitively in accordance with Local Plan requirements and reflected local concerns relating to the quantum, location and timing of development. Our site analysis, engagement with English Heritage and discussions with the Paignton BID Team highlighted the importance of celebrating the threatened Victorian Town Centre character which had previously been diluted by post-Victorian incremental development. We developed a network of Heritage Walks which, combined with enhancements to, and redesigned areas of public realm, accentuated the important connections between the town and the seafront. The routes, encouraging increased footfall to secondary, independent, retail areas, strengthen the unique and diverse historical character of the town. 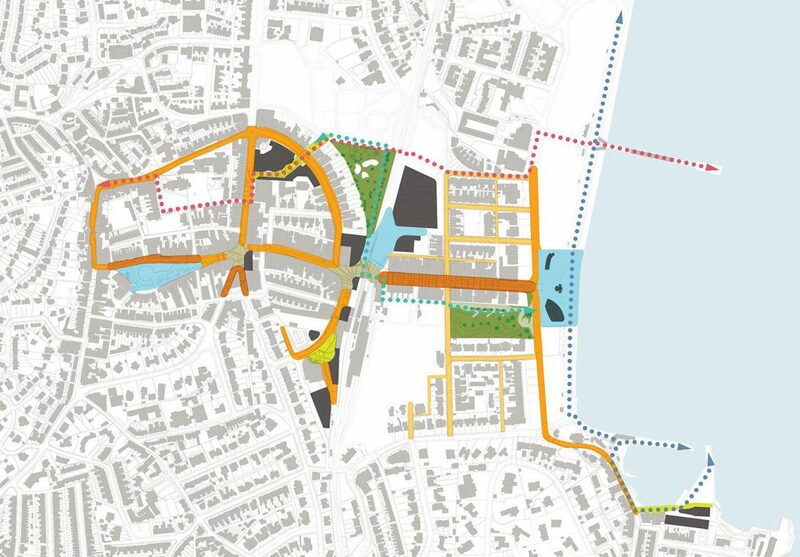 Following the preparation of masterplan concepts, technical workshops were held with Torbay Council Highways Officers to undertake more detailed scrutiny of the emerging masterplanning access and movement strategies. Revisions have recently been requested to seek flexibility in the access arrangements for phase 1 of Collaton St Mary in order to test alternative development scenarios. The Planning Team, led by Graham Stephens and supported by Sandra Tuck, and working closely with Masterplanner/architect Paul Seaver and the design team, shaped the client brief, identified key policy issues and responses, devised and executed the facilitated workshops and engagement strategy, focussed on building consensus with community and business interests, and drafted the masterplan in the context of the planning policy framework and the phased delivery of viable development proposals. As such, we consider the commission demonstrates the importance of planners and the planning process in driving forward positive change, building consensus and meeting strategic policy objectives through viable, attractive and flexible development frameworks. The commission demonstrated the variety of economic, environmental and cultural issues which the planning profession must address. A structured and evidence-based approach, aligned with a positive and constructive engagement highlighted the importance of the planner and the planning process in balancing numerous material considerations to deliver a well-conceived and integral development framework for an area under pressure to rediscover itself within the limits of a sensitive and historic setting. The Paignton Town Centre Masterplan was adopted as Supplementary Planning Guidance in June 2015. The Collaton St Mary Masterplan is anticipated to be adopted in 2016. 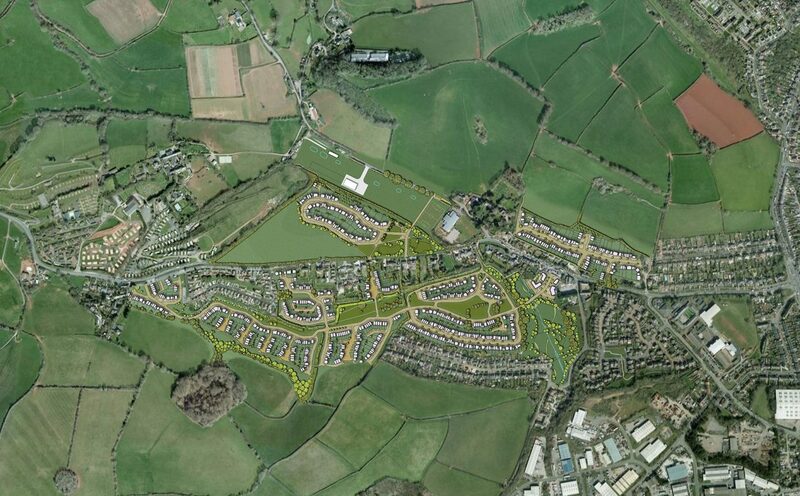 Torbay Council commissioned Stride Treglown to produce a masterplan for housing growth around Collaton St Mary, just to the west of Paignton. The brief was challenging, in as much as it required Stride Treglown to a) work closely with a community that didn’t want growth and b) to promote up to 800 new homes within a very sensitive landscape. Stride Treglown used the work already undertaken by the Council and the community to help build consensus for sensitive growth. They did this through a range of workshops and techniques, connecting with the resident and business community. They also used an approach that encouraged the community to understand the benefits of growth. Stride Treglown tested a range of different development opportunities, working closely with development partners to ensure viability and deliverability issues were properly taken into account. The work was presented to and agreed with the Council at regular intervals. The masterplan was used to support the new Local Plan, during the Examination Hearing and in evidence. It proved to be a very sound piece of work and was not challenged by the community or the development industry. 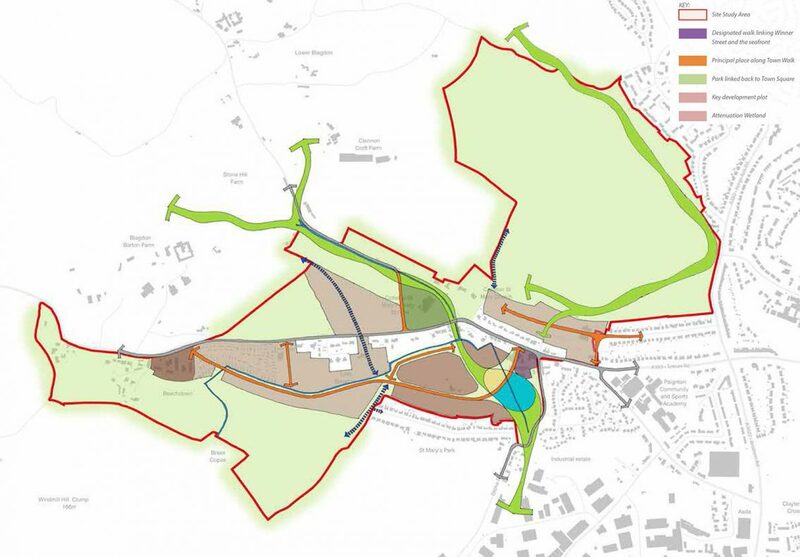 Stride Treglown delivered a masterplan that achieved the Council’s objectives, whilst also securing as much community and business support as was possible. The work was delivered on time and on budget. Stride Treglown proved themselves to be very flexible and responsive. The masterplan will ensure comprehensive and cohesive development, with elements of that already coming forward in the form of planning applications and more expected in the near future. As a ‘blue print’ for growth, the masterplan produced by Stride Treglown is already performing well.